My admiration for Rupert Murdoch's boldness and acumen and our previous 25 years of more than civil relations make it unpleasant, despite his unspeakable assault on me, to have to conclude that he is deeply repressed and malicious man. On Oct. 14, the Wall Street Journal, in reporting on the main sentence in the Galleon insider information case, ran a series of five photographs of what were described as "corporate criminals" with their sentences attached, from Bernard Madoff (150 years), down even unto me at six-and-a-half years. On July 18, 2010, the same newspaper ran an extensive lead editorial, headlined "Conrad Black's Revenge," in which it recorded that the four surviving counts against me (of an original 17) had been unanimously vacated by the Supreme Court, the principle prosecuting statute (the much abused concept of Honest Services), had been struck down and rewritten, and the Journal graciously apologized to me for having underestimated the merits of my defense. The high court excoriated the panel of the Seventh Circuit of the Circuit Court of Appeal from which I petitioned for, among other transgressions, the "infirmity of invented law." My cameo appearance in the Journal's rogues' gallery on Friday pretended that the original sentence had never been assailed or reduced. In the perverse American manner, the Supreme Court remanded the vacated counts back to the appellate court to assess the gravity of its own errors. This unrigorous and self-interested process produced a spurious but not unexpected resurrection of one fraud count and a finding of obstruction of justice. The fraud count involved a payment to me of $285,000. That it was undisputed in the evidence had been approved by the executive committee and board of directors of the company, and the obstruction was simply nonsense, and was not pursued in the local jurisdiction (Canada) as a violation of a document retention order, and it had no monetary significance. It was accurately described by a former deputy solicitor general of the United States at the Seventh Circuit, as "in 45 years of practice the feeblest case of obstruction of justice I have seen." It was this nonsense, maliciously retrieved to plaster a fig-leaf of plausibility on a misconceived and failed prosecution (that originally sought my imprisonment for life and fines and restitution of $140 million), on the destruction of which the Journal had so generously congratulated me 15 months before, that was invoked to put me in the company of Mr. Madoff and the others. I have written elsewhere of my protracted legal travails and the remaining entrails of them will be dealt with satisfactorily in the appropriate courts, (largely, fortunately, out of the U.S.). What is noteworthy in this dishonest donkey kick from the Wall Street Journal is what it tells us about the controlling shareholder of that newspaper, the now, to return a frequently proffered favor he served on me, thoroughly disgraced and in his own admission, "humbled," Rupert Murdoch. As I have often written before, he is probably the greatest media-owner in history, and his achievements in becoming the tabloid leader in London, in cracking the egregious Luddite print unions there, in breaking the triopoly of American television networks, promoting vertical integration with television outlets and film production, and his pioneering breakthroughs in satellite television worldwide, are Napoleonic in boldness of concept and skill of execution. And no one has been more vocal or consistent than I in saluting them. I competed with Murdoch, successful and quite cordially, in Britain for 15 years when we had the Telegraph newspapers, and for a time in Australia. Our relations and those of our wives were always quite convivial. I never joined the chorus of those who objected to his newspaper cover-price cutting in London; as a capitalist I thought he had every right to cut prices if he wished. And I publicly supported him when he almost went bankrupt 20 years ago, denouncing his critics as motivated by envy. I was naturally disappointed when, as my own legal problems arose eight years ago, his vast media organization swung into vitriolic defamatory mode, endlessly accusing me of crimes years before any were alleged. When revelations of his own sleazy behavior came to light in the hacking scandals in England, it also came out, confirming what I had heard from my own sources, and which I would have known from my knowledge of how his company is run, that Murdoch appears to have personally intervened to make reporting on my problems nastier (despite having assured me in writing that he would try to prevent excesses). My Madoffization last week almost certainly has the same exalted source. In earlier times, whenever there had been anything even slightly unfavorable about him in any of our publications, he had called me to object, or had his British managing director call my co-chief executive at the Telegraph. Even as he was stoking up the media lynch mob against me, he told his latest biographer, Michael Wolff, as he told others, of his high regard for me as a publisher, as if his febrile libels and fabrications were the coincidental, spontaneous antics of autonomous underlings. Now Muroch's company has been stripped naked as the lawless hypocritical organization it has long been; its employees think nothing of trolling for the private conversations of the British royal family, bribing the police, meddling in criminal investigations, tampering with the cell phone of a kidnap victim, and engaging in wholesale industrial espionage. 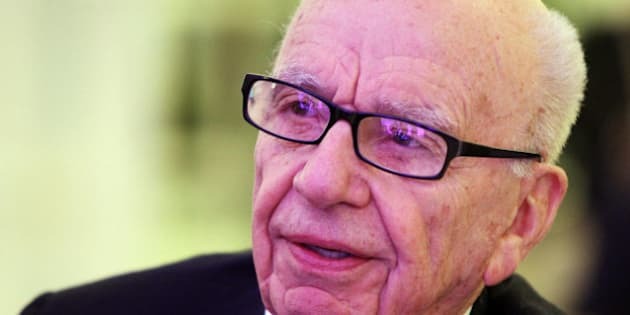 For decades, Murdoch has smeared, lied, double-crossed his political benefactors, including Jimmy Carter, Margaret Thatcher, John Major, a long sequence of Australian leaders, and the democratic forces of Hong Kong. When the extent of his skullduggery finally oozed out, sluggish and filthy, including the details of the British government's dotage on him, this summer, Murdoch's old possum routine didn't play as convincingly as it had in its many previous auditions, when he purported to be contrite over the shortcomings of errant employees. Bumbling into a parliamentary hearing in London, supported on each arm like a centenarian semi-cadaver, mumbling about humility, trying to represent News Corporation's board as independent when it is public corporate America's most docile board of directors and is composed entirely of hacks, retainers, and ex-employees; scrambling and whimpering and paying millions to victims of his outrages; putting his name on a Journal op-ed piece about education; it's all of a piece and none of it resonates anymore. In bygone days, he somehow carried off sprawling in a black costume on a bed in a glossy magazine and ruminating about being an "ambassador to Joe Six Pack," a champion of the little guy, and a spiritual person contemplating the consolations of Catholicism. At its most imaginative, it was a passably imaginative imposture. My admiration for his boldness and acumen and our previous 25 years of more than civil relations make it unpleasant, despite his unspeakable assault on me, to have to conclude that he is, in my personal belief, a psychopath. I think behind his nondescript personality lurks a repressed, destructive malice. His is, and has been proved to be, in some measure, a criminal organization. This, apart from weaknesses of leadership, was always the greatest vulnerability of post-Reagan America's conservatism: its reliance on a man who would put anyone over the side and hoist any colours when the wind changed. Now that the great defamer is a tottering, cowardly supplicant and a prime candidate for criminal prosecution on at least two continents, no one should count on his continued support for more than 24 hours at a time. For my part, I am already suing his company in Canada for the most artlessly libelous book since The Protocols of the Elders of Zion, by the defamer Tom Bower. In the extreme winter of his days, Rupert Murdoch's failing hands have dropped the mask; he is a malignant force and it would be a good thing for the world to be done with him.